I am part of the Church of God, Anderson IN. This is also known as the Church of God, Holiness, Reformation Movement. The following observations are in direct reference to this movement but may apply to others. I submit them for consideration and out of a great concern for this movement. Jim Lyon the General Director for the General Assembly of the Church of God, Anderson, reported “exploring” 3DM as a “potential partner and resource channels for leadership, congregational, and national church development”[i] This statement has been used to justify the use of 3DM in local districts. This is further highlighted by the Church of God’s national office support for 3DM on one of its websites. 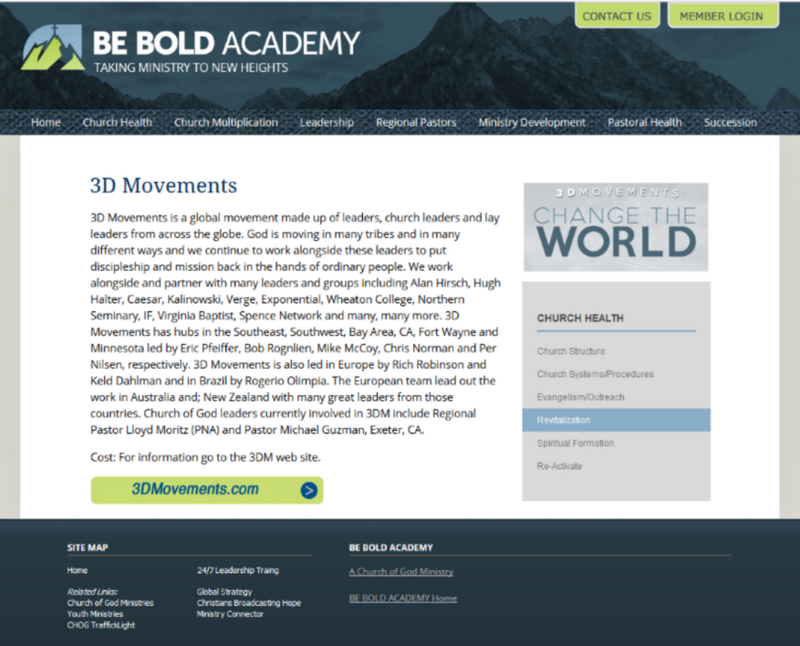 The above screen clipping is taken from the BE BOLD ACADEMY (http://www.beboldacademy.org/index.cfm/pageID/4707/index.html accessed February 15, 2016) web site ran by the Church of God Anderson Indiana. It uses language written by 3DM and used on their web site. (http://www.3dmovements.com/about/ Accessed February 15, 2016) Only the last line is added on the Church of God website, listing two Church of God ministers one of which is the district Minister for the Pacific NW Association of the Church of God (Lloyd Moritz). Right below their names is a link that takes you directly to the 3DMOVEMENTS main website. Ministers are directed under CHURCH HEALTH: Revitalization to use 3DM. In 2013-2016 the Pacific North-West Association of the Church of God located in Washington, Oregon and Idaho will have spent over $500,000.00 on establishing new churches using 3DM materials and polity. Another $20,000.00 was allocated to bring 3DM teachings and polity to at least two existing churches. [ii] The total funds available that is currently designated for new church plants that will use the 3DM model is over one million dollars. [iii] Other events have occurred where established PNA churches were encouraged to participate in discovering 3DM for their local churches. The materials presented here in the three sections have been presented to the Pacific Northwest Association of the Church of God board of directors and to the executive director. I can sum up their response so far in two words, ‘Trust me.’ They have continued to spend the funds on these 3DM linked projects. I can do no more than present the facts and hope someone, somewhere is listening. In my opinion no Church of God congregation, district, church plant or national figure should endorse or be using the 3DM materials. Here are some additional concerns I have in this matter as it relates directly to the Church of God Holiness Reformation Movement (Anderson) referenced here as CHOG. The spending and sending of CHOG dollars to an organization that is directly tied to the Church of England should not be an acceptable practice for the CHOG. The CHOG and the PNA is low on funds and asking for every congregation to send more. Yet how many would knowingly send their funds to the CHOG and the PNA if they knew it was being paid to 3DM. 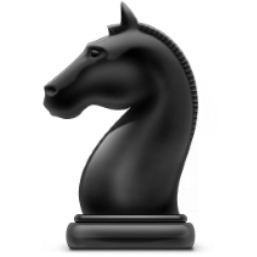 [v] 3DM’s structure, background, doctrinal beliefs, questionable exegetical methods and leadership are not in keeping with our beliefs or traditions. Using any CHOG or PNA funds for 3DM training and church planting should not be an acceptable practice. It is not to say there may not be some good in the methods or in some of the teachings or methods presented by 3DM and TOM. Yet, we know the Mormon church does good, but we would not turn over the supervision of new churches to them even though they do a better job of that then we do. We know Shriners hospitals help many children, yet we would not choose to take or share in their vows in our local churches. The stated goal of TOM and 3DM is to plant churches in major cities. Why is the Church of God planting churches for TOM and 3DM and by extension the Church of England? It is called the 3DMovement for a reason. Left to its own natural order 3DM will develop “into an all-encompassing, controlling factor within [a] church”[vi] as it did at North Heights Lutheran church. The leadership felt that “3DM [had] become… a governing rule at NHLC.”[vii] The telling statement in their letter reads; “Leaders were compelled to begin utilizing the language and teachings of 3DM. This drained finances, staff availability, a sense of community, and even usurped the power of the Holy Spirit.”[viii] This is not about training; it is about 3DM taking over the lives and ministry of local churches. The depth and control of 3DM appears to extend to controlling pastoral leadership and slowly taking over churches. This total transformation includes removing those who do not agree as not being “Persons of peace” while indoctrinating the rest of the congregation with “Lifeshapes” as the new language of believers. Gathering information to present on 3DM, The Order of Mission and Mike Breen is a lot like trying to herd cats. One moment it is there and the next it is gone. The end-notes contain additional information and web addresses where I accessed the information. Some of it has completely disappeared, while others have been scrubbed and changed to reflect a more ecumenical format. The web shot at the end of part 2 should on its own show the real structure of 3DM and TOM. The video referenced on youtube is the most telling of all. Mike Breen confirms the original intent and purpose of creating 3DM to spread the teaching of the Order of Missions and to serve as the financial arm for TOM. The materials on 3DM, TOM and Mike Breen are not listed in any one place and appear to contradict what some have heard at training they received at 3DM events. The local church I pastor is currently examining how much financial support they should provide to any organization that spends hundreds of thousands of dollars on planting churches[ix] that use the 3DM materials. They also have great concerns about national leadership that seems to endorse 3DM to local churches and regional districts. NOTE: I personally wrote to Jim Lyons the National Director for Church of God Ministries (Anderson) concerning this matter in 2014 but did not receive a reply. At a meeting in March of 2016 held at Fairview Church of God in Seattle WA. I personally handed Rev. Lyons a second letter that he said he would respond to. I am still waiting as of May 2017. As I complete this three part series of reports on 3DM, TOM and Mike Breen it is just the tip of the iceberg. There are many facets I have not covered. I have written nothing dealing with ‘the Covenant Kingdom Network’ (CKN). Someone else will have to figure that one out. Each pastor and local congregation will have to wrestle with these materials. I hope these materials have been beneficial in opening eyes and hearts to the truth that is 3DM, TOM and the teachings and theology of Mike Breen. As the updates show Mike Breen has moved on from director of 3DM to a new movement to reach the leaders (pastors) of churches and work with them directly. Looking at his past tract record this should not be seen as positive in any way. Many have written and some have called me asking what can be done to help get 3DM out of their churches. In most cases the sad truth is nothing. The best way is to be forewarned and to keep 3DM out of your church in the first place. [i] http://www.jesusisthesubject.org/files/downloads/documents/ga/2014GAPacket-FinalSections4-7.pdf page 56 Accessed March 18, 2015 Report from the General Director to the 2014 General Assembly 10 ‐ Month Summary – Submitted on 19 June 2014 has been pointed to by local PNA officials as proof that the GA and your office are in support of 3DM. [v] These funds donated by the churches of the PNA may not go directly to the 3DM church plants but the donated funds of the PNA churches are supporting the organization (PNA) that is planting the new churches. [vi] http://northheightschristianacademy.org/more-info/3dm ‘our’ replaced with ‘a.’ This letter is an open declaration of what many have stated privately. [vii] http://northheightschristianacademy.org/more-info/3dm verb tense changed for better reading flow. [ix] Much of the money used to plant these new churches comes from churches that closed and left the property to be sold and the funds used to plant a new church. PNA Leadership has told me since this has not come in through regular church giving it should not be my concern. Those saints who built those churches sacrificed as members of local Church of God, Anderson, IN congregations. They must be rolling over in their graves to know that the money is being used to establish new churches on the 3DM – TOM model. Currently over $500.000.00 has been spent or is budgeted to be spent on these new church plants through 2016 in the PNA using the funds from these closed churches.